To Cite: Hossini H, Rezaee A, Ayati B, Mahvi A H. Off-Gas Treatment of Ammonia Using a Diffused Air Stripper: A Kinetic Study, Health Scope. 2016 ; 5(1):e26479. doi: 10.17795/jhealthscope-26479. Background: The presence of excess ammonia nitrogen in aqueous environments has caused various problems such as eutrophication, oxygen depletion and aquatic toxicity. Hence, it is necessary to have special consideration in the discharge of ammonia to environment. Objectives: The aim of this study was to study kinetic of ammonia degasification at a short-time (6 hours) with relatively constant pH and temperature. Materials and Methods: Ammonia degassing was carried out using a diffused air stripper. The unit consisted of 1 L cylindrical column with dimension of 30 × 8 cm. The flow rate was set at 2 L/minute at 6 hours. The operating parameters such as ammonia, nitrate, nitrite, electrical conductivity (EC), the oxidation-reduction potential (ORP), and pH were analyzed according to standard methods. Results: According to obtained results, the maximum removal efficiencies were determined 17%, 35.5%, 31%, 66%, and 85.5%, for 50, 100, 200, 500 and 1000 mg/L ammonia concentrations, respectively. A first-order kinetic model was adopted to represent the ammonia degassing. Conclusions: The ammonia degassing is a simple and suitable technology for ammonia removal at high concentration. Undesirable removal efficiency (17%, 35.5% and 31%) can be occurred in suitable pH 11 in the presence of lower ammonia concentrations (50, 100 and 200 mg/L). Urbanization, industrialization, and agricultural activities have been entered large quantities of contaminants to the ecosystems and aquatic sources (1). Ammonia has been recognized as a major pollutant in both municipal and industrial wastewater. It exists in various industrial wastewater such as coking, chemical fertilizer, coal gasification, petroleum refining, pharmaceutical and catalyst factories (2). Although ammonia is an essential element for living organisms, it can contribute to the accelerated eutrophication of lakes and rivers, dissolved oxygen depletion, and toxicity in receiving water bodies (3, 4). Standard levels of ammonia in surface water have been reported from 0.25 to 32.5 mg/L (ppm) in the US (5). Permission levels of ammonia concentrations in ambient air have been recommended by The national institute for occupational safety and health (NIOSH) and The occupational safety and health administration (OSHA) 25 and 50 ppm, respectively. Various processes have been utilized to remove ammonia from water and wastewater such as air stripping, selective ion exchange, break-point chlorination, denitrification, and biological nitrification (6). The biological processes are interested techniques because environmental friendly aspects, but the biological system at higher amounts of ammonia could be failed. Also, it has a toxic effect on the biological population. On the other hand, biological processes (mostly nitrification) could be consumed alkalinity and therefore they need to chemical additives. Production of a large amount of byproducts and undesirable materials are a disadvantage of the proposed methods such as ion exchange and break-point chlorination, which require further costly treatment and handling. Air strippers removed volatile organic chemicals from aqueous solution by providing contact between the liquid and air. The treated air could be released to the atmosphere (7). It offers many advantages such as ability of volatile compounds stripping, low cost and degasification of ammonia at high level concentrations (8, 9). A successful air stripping performance depends on some factors that can be asserted as follow: 1) characteristics of the volatile material such as partial pressure, Henry’s constant, gas transfer resistance; 2) solution and air temperature; 3) turbulence in gaseous and liquid phases; 4) the surface area-to-volume ratio, and (5) striping time (10, 11). 1- To determine the removal efficiency for air stripping at high and low concentrations of ammonia. 2- To demonstrate the high potential of air stripping in upper ammonia concentration. 3- To determine the ammonia volatilization and kinetic constant for diffused system in a short- time (6 hours) with relatively constant pH and temperature. 4- To Evaluate and determine the ammonia byproducts such as nitrate and nitrite. 5- To trace the oxidation reduction potential and EC variation during air stripping of ammonia. All reagents were prepared in analytical grade. An aqueous stock solution of ammonia (from NH4Cl salt) was prepared in deionized distilled water. Different concentrations of ammonia were obtained by diluting the stock solution. The pH was adjusted to the desirable value with 1 M H2SO4 and 1 M NaOH. The ammonia stripping unit consisted of 1 L cylindrical column with the dimension of 30 × 8 cm using a diffused aerator (HAILEA Aq. Air pump, 5.5 L/minute) in a laboratory scale. Figure 1 illustrates the flow diagram of ammonia air stripping system. Column, ORP/EC/pH meters, the aerator pump and aeration system, thermometer and heater were main components of the proposed system. Air enters through diffusers and rises through the liquid to exit at the top of the column. The ammonia gaseous sample transfers from the water to the air as the bubbles rise through the water. Transfer of the volatile compounds from the water to the air can be improved by increasing the column depth or decreasing the size of bubbles. At all experiments, flow rate was set at 2 L/minute for 6 hours. All experiments were analyzed according to standard methods for the examination of water and wastewater. Nitrate was determined using a spectrophotometer at λmax 220 and 275 nm. The nitrite content was analyzed by colorimetric method using sulfanilamide and naphthylethylendiamine di-hydro-chloride regents at λmax 543 nm. The determination of ammonia was performed by phenate method (λmax 640 nm). 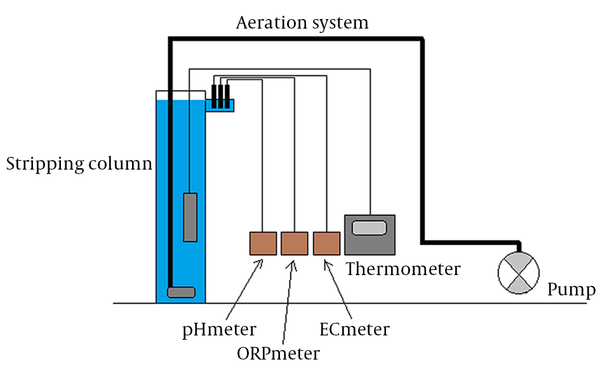 The pH, EC and ORP were measured with a pH and EC meter and an ORP probe (Eutech). 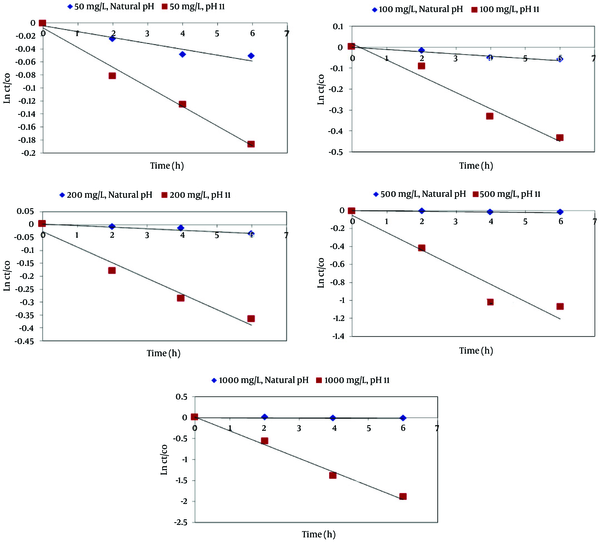 In this study, ammonia concentrations from 50 to 1000 mg/L were considered for the experiments. The overall ammonia removal was presented for pH values 7 and 11 for 6 hours. It is clear that the better ammonia removal was provided from wastewater during highly alkaline pH 11 for all levels of ammonia. The ammonia degassing was seen with different efficiency during working time and in all ammonia levels (Figure 2). Higher removal efficiency was obtained in pH 11 and higher concentrations of ammonia. Maximum removal efficiency for 50, 100, 200, 500 and 1000 mg/L were determined about 17%, 35.5%, 31%, 66% and 85.5%, respectively. In the unadjusted pH, maximum efficiencies of 5%, 5.8%, 3.7%, 2.1% and 1.7% were obtained for 50, 100, 200, 500 and 1000 mg/L of ammonia, respectively. The results of ammonium degasification, intermediate byproducts, ORP, EC and pH are summarized in Table 1. The generation of nitrite during all experiment was not significant. However, nitrate has a remarkable change than nitrite in all concentration levels (Table 1). Generally, ORP and EC values were decreased with decrease in pH values. The ORP values were negative for pH 11 (Table 1). In the next step, the ammonia degassing rate was determined using first order kinetic for experimental data (Figure 3). Calculated values and constants for various concentrations and pH values are summarized in Table 2. A, Initial concentration 50 mg/L; B, Initial concentration 100 mg/L; C, Initial concentration 200 mg/L; D, Initial concentration 500 mg/L; E, Initial Concentration 1000 mg/L. Table 2 is shown data for ammonia degasification and other responses when different initial concentrations of ammonium and pH were used. The results were obtained after 6 hours of constant air loading at 23 ± 2°C. 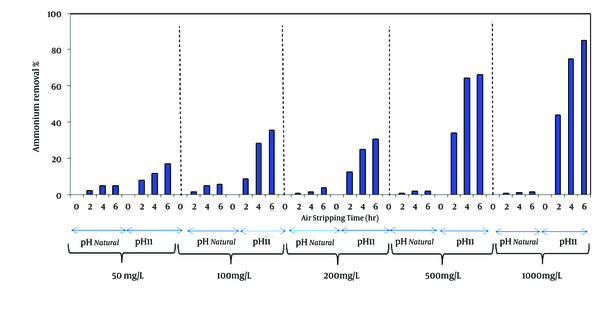 According to the obtained results, higher ammonia efficiency was obtained with increase of pH and concentration (Figure 2). Maximum removal efficiencies for both adjusted (natural pH) and unadjusted (~11) pH were determined about 17%, 35.5%, 31%, 66%, 85.5% and 5%, 5.8%, 3.7%, 2.1%, 1.7% from 50, 100, 200, 500 and 1000 mg/L of ammonia, respectively. Higher efficiency removal at higher pH can be occurred by displacement ammonium/ammonia equilibrium. The composition of these constituents depends on the pH and temperature of the solution from the following dissociation equilibrium. Therefore, in higher pH there are greater proportions of the nitrogen in form of ammonia gaseous, and the more percent is stripped (1). Similarly, other researchers report that the higher efficiency removal of ammonia is achieved at pH 11.7 rather than lower pH during air stripping (7). When the pH value is adjusted in ranges 11 - 12, total ammonium is almost converted into molecular form of ammonia in a solution, and ensuring the air degasification of ammonia. However, the overall performance is dependent on the mass transfer rate of ammonia from water to air (12). Ammonia degasification first order kinetic constants are shown in Table 2. Accordingly, the first order constant (k) or ammonia loss constant with correlation coefficient (r2) was determined for all concentration levels. Additionally, the first order kinetic plots for different ammonia concentration are illustrated in Figure 3. Better the ammonia loss constant with more fitted conformity is observed about 0.3272/hour and 0.994 for 1000 mg/L, respectively. This fact offers that the mass transfer rate of ammonia from the suspension to air is very high compared to other concentrations. Similar result has been reported that the removal efficiency was increased for ammonia stripping from 80 mg/L to 1574 mg/L (8). Depending on pH, the ammonia in aqueous solutions is in equilibrium with its protonated forms. However, a given amount of ammonia will be divided between NH3 and NH4+ ion, the higher concentration of sum of ammonia species the higher amount of ammonia dissolved in water in ammonia form is present. Because of equilibriums between the gaseous-liquid phases, in saturate solution with air, the gaseous phase will contain some amount of air (this amount will be released form aqueous solution), and the air stream will transport it from the equilibrium. It means the free and summarized NH3 concentration in the solution will be decreased until the limit, where the partial pressure of NH3 above the solution becomes as low that this method becomes ineffective. The equilibrium is dependent to concentration and pH. When we have ammonia in the solution at neutral or acidic conditions, we have not ammonia stripping. The equilibrium is dependent to concentration and pH. When we have ammonia in the solution at neutral or acidic conditions, we have not ammonia stripping ammonia can form NH4+ ion in aqueous solutions, therefore if the residual ammonia content is in ammonium ion form, the stripping is not effective. Where, Pa that is the partial pressure of a gas above a liquid is directly proportional to the mole fraction of the gas (xa) dissolved in the liquid. The Ha is known as the Henry’s constant. Henry's law constant (HLC) represents, for environmental conditions, the air-water equilibrium partition coefficient for a particular chemical compound presents in a dilute aqueous solution (dilute typically defined as less than 0.001 - 0.01 mole fraction, corresponding to less than 5 - 50 g/L for a compound with a molecular weight of 100 g/mole) (13). As seen in Table 2, Henry’s constant values based on two common units are presented (14). The value of the constant generally increases or decreases with the liquid temperature. However, the solubility of gases generally decreases with increasing temperature (15). Practical application of the technology for contaminant removal is generally limited to compounds with Henry’s constant values greater than 100 atmospheres (9). In cease of ammonia stripping, if removal efficiency as a function of temperature is related to energy consumption, the best ratio of energy costs/benefits is achieved by keeping the process temperature at 60°C (14). The increase in ammonia removal efficiency caused the increased nitrate/nitrite production. Generally, no significant amount of nitrite was produced at all levels. Nitrite (NO2−) is the unstable form of nitrogen and is easily converted. So, lower amount is seen during air stripping (Table 1). However, more production rates were observed at higher ammonia removal efficiencies. Variation data of the ORP via ammonia stripping process are provided in Table 1. The concomitant decreases in ORP and increases in pH were observed with increasing the ammonia removal percentage. Variations of ORP were determined in range −220~ −146 mV. Generally, low pH and high ORP create oxidizing conditions whereas high pH and low (negative) ORP stand for reducing conditions. In this regard, variation of EC was determined, and no significant changes in the amount of EC were exhibited during ammonia degasification time. Air strippers frequently become fouled by mineral deposits when calcium exceeds 40 mg/L, iron exceeds 0.3 mg/L, magnesium exceeds 10 mg/L, or manganese exceeds 0.05 mg/L, or from biological growth. Activated carbon and thermal oxidation are commonly used to treat the off-gas (9). At low concentrations of stripped gaseous, operating costs appear to be equally affected by the mass transfer coefficient of the target compound (16). The costs for removing low concentrations of tetrachoroethylene (TCE) are nearly twice those for removing vinylidine chloride, a compound with a much higher Henry’s constant (17). 1- The ammonia degassing is a simple and suitable technology for higher concentration of ammonia. 2- Successful ammonia stripping efficiency is dependent on initial pH and ammonia concentrations. 3- Lower pH cannot able to remove ammonium ions due to no change in NH3/NH4+ equilibrium. 4- Ammonia and pH were seen as main affected factors. 5- Undesirable removal efficiency can be occurred in suitable pH (more than 10.5) in presence of lower ammonia concentration. 6- To remove the lower amounts of ammonia in suitable pH, more time and higher aeration flow are required. The authors express sincere gratitude to Tarbiat Modares university and Northern Khorasan water and wastewater company for the financial support in this research. Also, we would like to acknowledge Laszlo Kotai from Hungarian academy of sciences for helpful discussion. Authors’ Contribution: All authors participated equally in writing the manuscript.